Check-In Time is Noon for RV sites and 3:00 pm for Lodging. Check-out time is 11:00 am. For a complete list of fire safety rules, please visit http://koa.uberflip.com/i/816744-fire-rules-reference-card. Wood fires are permitted in a contained fire pit or ring – ground fires are not permitted. All of our accommodations come equipped with a Fire Ring. Quiet time is observed from 10 pm until 7 am. Due to the limited size of our campground and our desire to allow as many campers as possible to enjoy our uniquely beautiful location on the Crystal River, all stays during the 2018 camping season will be limited to 14 days. Also, we cannot accept group reservations from Memorial Day to mid-September. 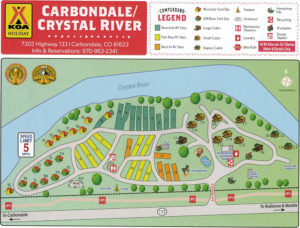 © Carbondale/Crystal River KOA 2018. All Right Reserved.